Bible Contradiction? Did Jesus perform many signs and wonders? For today’s post we will tackle the question the Skeptic Annotated Bible asked: Did Jesus perform many signs and wonders? 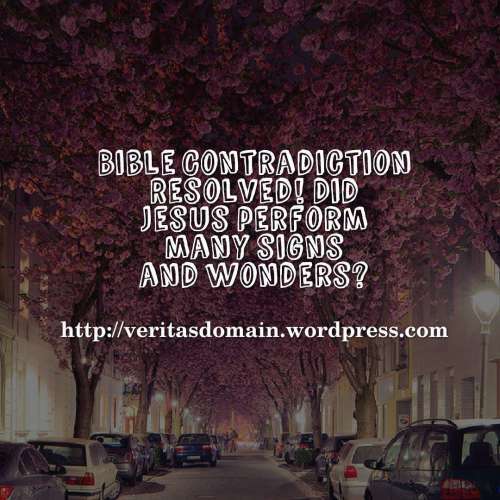 This entry was posted on Tuesday, May 22nd, 2018 at 4:18 pm	and tagged with Christian bloggers, Domain for Truth, Jesus Christ, Jesus' miracles, reblogs, refuting skeptics and posted in religion. You can follow any responses to this entry through the RSS 2.0 feed. I don’t think anyone who was blind, and then Jesus of Nazereth came to town and gave him physical sight is soon going to forget about it. Of course Jesus was famous for his signs & wonders and his fame spread rapidly in His three years of ministry – the miracles were proof He had been sent by the Father.